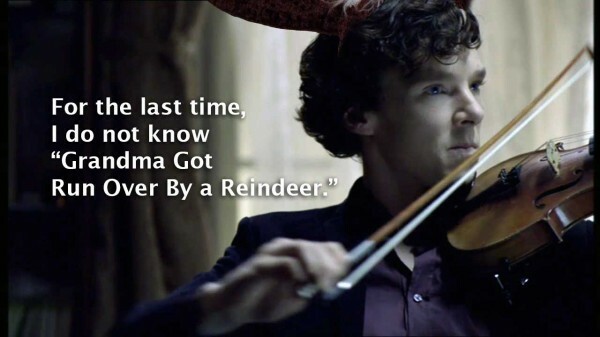 Do You Know All I Want For Christmas Is You, Sherlock? Okay, I have to confess I’ve spent a large chunk of playing the Star Trek Into Darkness teaser (both the US and the Japanese versions) largely to hear Benedict Cumberbatch’s voice. I swear the man’s voice could sell me Windows 8 (okay, that might be going a bit far, byt the man could definitely sell me Windows 8. I wouldn’t actually install it on anything, but I’d buy it from him.). So just in case you’ve missed it, I’ve embedded the English video below. But to give equal time, BakerStreetBabes brought to our attention a very short film with Martin Freeman entitled “The Girl Is Mime” that he did in 2010 for a special project. The entire thing was written and shot in 48 hours (I’m assuming with very little sleep on the part of the writer, director, and most of the other people involved). It let’s Martin Freeman demonstrate just how magnificently expressive his eyes are. Oh, and it’s from Vimeo, so you may have to be a little more patient with download speed. The Girl Is Mime – Starring Martin Freeman from Tim Bunn on Vimeo. Evil Benedict Cumberbatch With THAT Voice! Okay, back to creating more Sherlock (and — knock wood — Sherlock Holmes) Holiday Madness. This entry was posted in Captions, Fan Videos, Other and tagged bbc sherlock, benedict cumberbatch, martin freeman, Sherlock Holmes on December 7, 2012 by JH Watson.